I haven't done a post on general game design in a while, but in my spare time I've been catching up on the Assassin's Creed series and have recently finished the fourth title in the series. As such, I thought it'd be a good thing to do a bit of analysis of how the game has developed over time; a series of posts that are retrospective reviews and part on-going analysis. There are no spoilers in this post, but subsequent posts in this series may have some. I'll warn you at the outset if that's the case. The game starts off in a somewhat expository manner, explaining that the main character of Desmond Miles is going to be reliving the past through "genetic memory" of one of his ancestors: Altair, an assassion who lived during the Third Crusade near Jerusalem. After a brief tutorial session, the game proper starts. In a way, this opening set the scene somewhat for the rest of the series. Every game since has started with some exposition to either get players up to speed somewhat, or remind them of what they already should know. This isn't a bad point of the series; it happens quickly, tells players only the essential details, and throws them into the action. 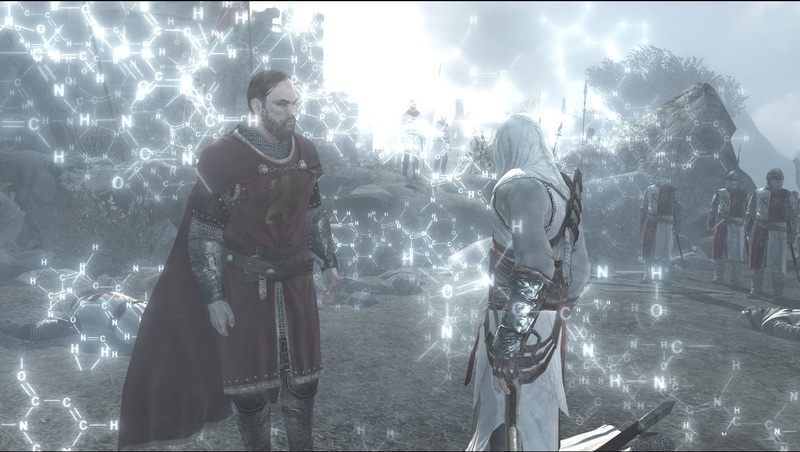 The storytelling is conducted in a reasonable manner, most of which occurs through cosmetically interactive cutscenes. 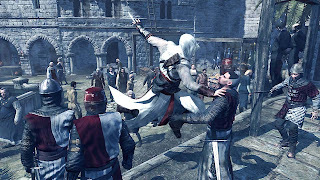 In the cutscenes the player still has limited control over the movement of their character and sometimes of the camera. There are limits on the range of both, but it still gives the player the feeling that they have some control while still retaining focus on the key parts of the scene. It also includes the strange concept of "glitches" whereby quicktime effects allow the player to press a button to get a "better camera view" of the cutscene at hand. While this is an interesting enough idea, it does distract the player from the content at times, and leaves them wondering "well, why can't I just have the best angle automatically?". This concept was fortunately ditched from subsequent games, but so was the cosmetic interaction. DNA strands on-screen.. Quick! Push a button! "The Kingdom" which is the open world space between the three cities of Jerusalem, Acre, and Damascus, is one of the most expansive and attractive open world areas in a game to date. It's big, has variety in design, and has some lovely landscape throughout it. It's really a pity that more wasn't done with the area and that it effectively just acts as a treasure hunt area between the cities where all the action happens. It's an area where no set gameplay happens. It's just there for the sake of being there and providing some spatial separation the "real" locations of the game. The level design for all three cities is also spectacular, and the view from some of the highest points is quite dizzying. 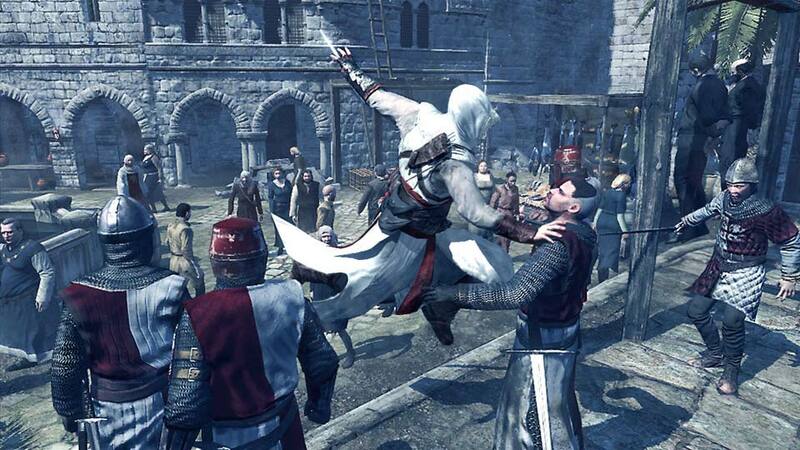 Much of the player's time can be (and for the most part was) spent by players climbing to viewpoints, tracking down citizens to save, and hunting through cities and the massive open world area that linked them for collectible flags and templars to kill. These areas are beautifully designed, and even though the technical side of the graphics shows its age today, they are still impeccably designed and look gorgeous. Even now, it's quite easy to stop and admire the handiwork of the talented people of the art team. It's just unfortunate that you're only exploring their landscape mostly to do busy work, and scour it in search of virtual achievements. Yes, that's right, Assassin's Creed has achievements for finding all the flags and killing all the templars scattered about the levels of the game. That's the only gameplay incentive provided to the player to explore, which is a disappointment considering how good it still looks. 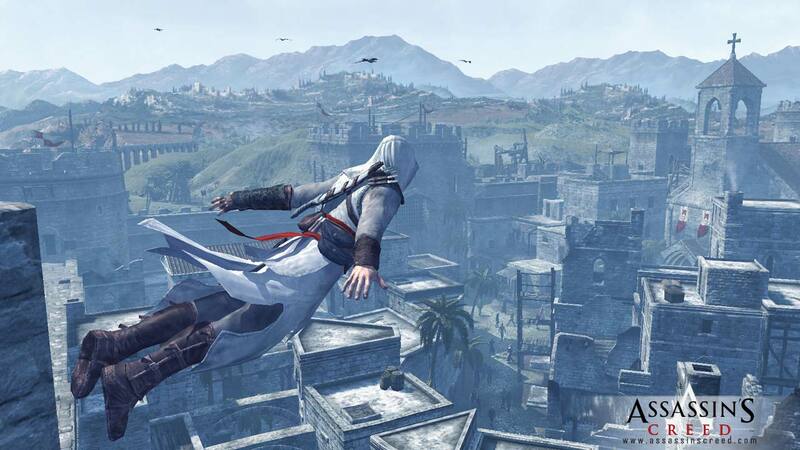 The main problem with Assassin's Creed is that in retrospective it feels like a tech demo. I enjoyed it at the time, and I can even enjoy it now, but the problem is that the development team really hadn't worked out what they wanted to do in terms of gameplay. The gameplay effectively consists of: free running, exploration, repetitive information gathering missions, and nine assassinations. Ultimately, the bulk of the hours for most players will end up being spent doing exploration, which is a bit of a sad indictment on the gameplay designers, because most of the enjoyment of the game is being derived through the work of the level designers. Of course, you can just run around assassinating guards and getting the satisfying semi-metallic "schink" noise of a successful blade kill on unsuspecting templars, but there's a limit to how long this can last. Especially since escaping any guards chasing you if you happen to get spotted tends to be laughable a laughable simple prospect. The outside of this, the actual "side missions" the game offers are lamentably straightforward and unfortunately tedious. Saving citizens is a simple prospect of killing a few guards. Eavesdropping for information is sitting on a bench, pushing a button and watching a cutscene. Interrogations require you to walk behind someone, and then just mash the attack button until they yield. Pickpocketing is much the same, except you have to hold the button instead of pushing it repeatedly. There's nothing engaging or varied in these tasks, and the benefits for performing them are fairly limited. Achievements, slightly increased health, and "assassination information" that typically didn't really offer much that was useful for the player. Fortunately, you could get away with only doing a couple of these (rather than all six) before unlocking each assassination. To anyone playing the game now, I would strongly recommend doing on the bare minimum, then jumping to the assassination. 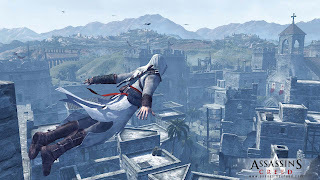 The assassinations themselves are where the most fun of Assassin's Creed comes from, and it was obvious that this was recognised by the designers, because that's what was expanded significantly in the sequels. They're still fun in the original game. Getting a path close to your target, chasing them down, and ending their life with your hidden blade are... well, being an assassin. This is what players wanted from the game, not "sitting on a bench" creed. The problem is that when you play through the game without engaging in the repetitive aspects of the gameplay, you could potentially get through it in around 8 hours, though I suppose that is on par with (or better than) your average modern day shooter. The core "historical" sections of the game are also interspersed with modern day segments where you play as Desmond Miles. This also ends up being a bit tedious as well. Desmond walks at an inexorably slow pace, and has very limited interaction with his surroundings. Also, if you don't want to miss out on any of the "story" you have to go around and scour the area he is in whenever you get the chance, else it's quite easy to miss something. Mercifully, the area isn't that large, but that just makes it worse when you're comparing his speed with that of his ancestor Altair. After last week's trailer, I feel I should provide some indication at to what I've been doing recently on the mod apart from making trailers and screenshots. The short answer is: playtesting. For anything of a decent level of complexity, you'll never get everything perfect the first time, and there are inevitably things that require testing and in-game observation in order determine whether they work. Is the player having to run around too much, does the area feel too empty or busy? Are the NPCs wandering around naturally or should their movement be changed. These are the sort of things that a designer gets better at with practice, but they still need to be observed in the game to make sure they're working as they should. Too empty? I have to explore to know for certain. The other inevitability is the presence of bugs. I've yet do any large project where everything works perfectly first time. An unassigned script, an overlooked set of possibilities combining to provide a dialogue choice that doesn't make sense, or any number of issues can cause a problem that will crop up for a player. Perhaps the most significant problem I found was that it was possibly to short-circuit and complete two quests practically immediately after receiving them if the player had followed a particular course of action beforehand. This was obviously an undesirable situation, but I'd not contemplated the possibility that those events could or would occur in that order, hence I'd not catered for it. 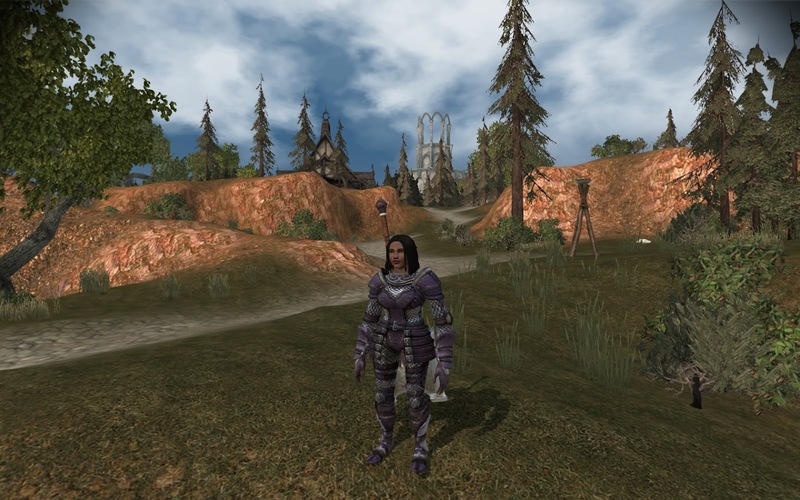 A few hours and a large number of tweaks later, the dialogue now had appropriate dependencies to prevent players from effectively skipping and missing out on a large amount of dialogue. One thing to note from this is that some quests can be solved entirely through dialogue and exploration rather than through combat. I wanted to give players options in the way they pursue a course of action, and have catered for diplomats as well as warmongers. I'm just now fortunate enough to see those different options coming together within a playable product.